You may now explore AGROVOC using a new search & browse facility, called Skosmos. See 'Search' in the AGROVOC menu, http://aims.fao.org/standards/agrovoc/functionalities/search. Skosmos is powered by the National Library of Finland and was originally created for its Finto service. The browser reads RDF/SKOS data, accessed through a SPARQL endpoint. For more information about AGROVOC formats and releases, please visit our dedicated Access AGROVOC page. You will also notice that all AGROVOC pages, together with the whole AIMS website, have a new look-and-feel. We hope you like it! The interface should be quite intuitive. You start with a search box, where you can type the term you are looking for. You can limit your search to a single language, or search across all the 21 languages of AGROVOC. While typing, the system will provide you with a list of suggestions for your search. As an example, try with the term 'climate change'. After hitting the button "Search", a list of results will appear on the right side of your screen: these are concepts that you can then explore by clicking. After clicking on a concept, the hierarchy related to that concept will appear to the left-hand side of the screen. The great news about this tool is that it is fully compliant with the current format of AGROVOC. This means that it allows you to visualize all SKOS-related information available in AGROVOC. For example, you can now visualize the links to other vocabularies, when present - something that was not possible before. 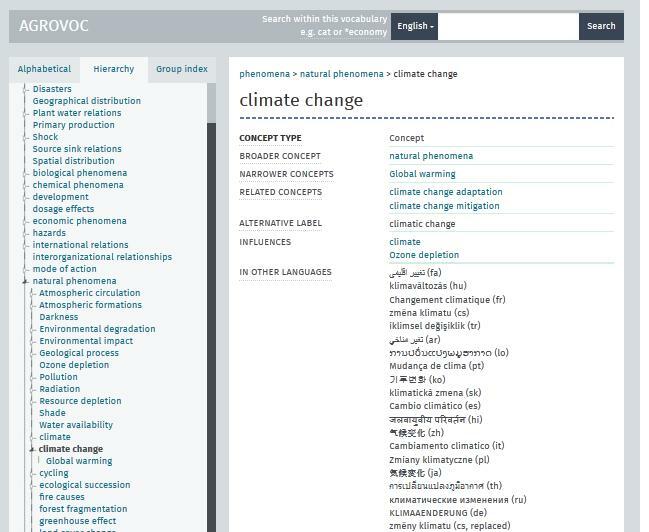 For the whole list of vocabularies linked from AGROVOC, see the Linked Data page. We really hope you like this new tool the same way we do. If you have comments, suggestions, or if you spot a bug, please do not hesitate to write to us!